Only seeing a few rides?? Vero Cycling hosts at least 7 group rides per week, at all riding paces- if you're only seeing one or two, you are either not logged into the website (do so on the Home Page), or you're not yet a member. We welcome everyone to try a Saturday morning ride at 9:00 from Jaycee Beach Overflow Parking Lot, 4248 Ocean Dr., Vero Beach. On Saturdays we have multiple rides leaving from the park at different speeds and distances from a ride that averages 18-20 mph to a neighborhood ride suitable for beach cruisers, and several levels in between. Please find the ride leader and sign in for the ride. 1. If you are new to riding in pace groups, please let one of the leaders know so that they can work with you to help you learn how to ride safely in a pace group. If you would like some basic training on cycling safety, please contact one of the League Cycling Instructors listed below. Bicycle helmets are required on all Vero Cycling rides. 2. Please click the 'Register' button for rides you will attend, and sign up for the ride. This allows us to contact you through email should anything on the ride change (weather issues, etc). If you want to confirm the details for any of these rides, please email or call the ride leader. 3. The ride leaders below are all volunteers. There will be days when some or all of the ride leaders cannot make the ride due to other commitments. On those days, the ride (or at least a particular pace group) may be self directed. 4. A sign-in sheet will be provided at each ride, containing a Waiver of Liability and a spot for your emergency contact information. Please sign in on the waiver if you DID NOT register on line, this is a requirement for riding with the club. 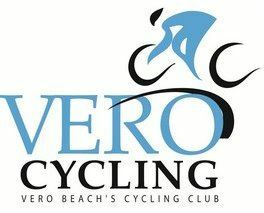 All regular Vero Cycling Club rides are hosted by one or more of our Vero Cycling Club Ride Leaders.